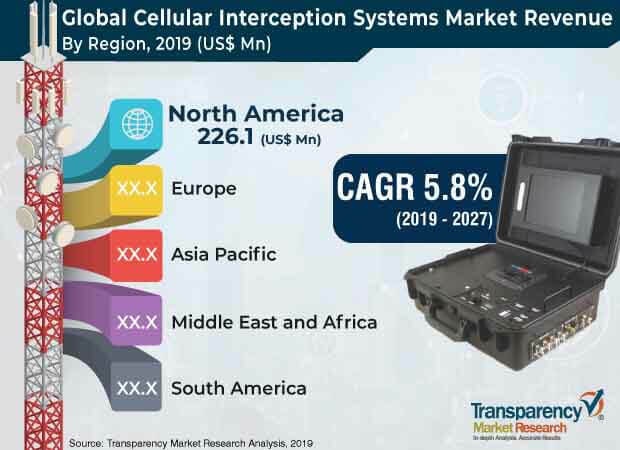 According to a new market report published by Transparency Market Research, the global cellular interception market is expected to reach a value of US$ 978.3 Mn by 2027, owing to an increase in the usage of optical components in energy efficient networks. The market is projected to expand at a CAGR of 5.8% during the forecast period from 2016 to 2027. The market in North America is anticipated to expand at a robust growth rate, followed by that in Europe, during the forecast period. The public sector segment hold a dominant share of the global cellular interception market, due to an increase in deployments by local law enforcement agencies and other defense and military agencies. A rise in the adoption of advanced technologies is leading toward improved and modified operational activities. Due to this, the demand for targeted communication, location tracking, and cyber solutions is increasing among end-users, especially in the public sector. The solutions offer safety and security and help in collecting military intelligence. Additionally, a rise in criminal activities as well as terrorism around the globe is expected to drive the adoption of cellular interception systems by law enforcement agencies and government organizations. The systems improve safety and security and enhance military and law enforcement intelligence. This is anticipated to boost the growth of the cellular interception market during the forecast period. The cellular interception market has been segmented based on component, technology, system, application, and geography. In terms of component, the hardware segment of the cellular interception market is anticipated to expand at a rapid growth rate during the forecast period. This is mainly due to strong demand for devices capable of intercepting newer communication technologies such as 3G/4G/LTE and satellite communications. The hardware segment is projected to constitute more than 75% share of the global market. In terms of system, the tactical interception systems (IBIS - in between interception system) segment is projected to dominate the global cellular interception market. The IBIS cellular interception system is an entirely autonomous system that has Universal Mobile Telecommunications System (UMTS), Long-Term Evolution (LTE), and Global System for Mobile Communications (GSM) networks. Moreover, it offers a portable and small IMSI catcher, which is uses for large distance operations. North America is a leading region of the cellular interception market, with more than 35% share. This is mainly due to strong penetration of cellular interception system technology across the public sector such as in government organizations and law enforcement agencies in the region. In addition, the growth of the cellular interception market across the region is mainly supplemented by an increase in demand for cellular communication transmission using advanced technologies such as 3G/4G/LTE. The market in Asia Pacific and Middle East & Africa (MEA) is expected to offer attractive growth opportunities in the coming years. There has been rapid deployment of telecommunications infrastructure in India for enabling the use of 4G and LTE technologies. This has led to the mass adoption of mobile communications devices capable of utilizing the new cellular communications technologies for voice calls, high volume data transfers, and more. There is a rise in the degree of Internet penetration in the region. This is anticipated to drive the adoption of cellular interception systems among end-users in the region. Thus, the market in Asia Pacific is expected to expand at a significant CAGR in the coming years. The research study includes profiles of leading companies operating in the global cellular interception market. Some of the key players profiled in the market include Ability, Inc., ADS Group, Axiom Technologies Pvt. Ltd., Endoacustica Europe s.r.l., HSS Development, Netline Communications Technologies (NCT) Ltd., NovoQuad, Inc., PICSIX, Shoghi Communications Ltd., Stratign, and TheSpyPhone.